This beautiful bride and groom portrait was taken during a Toronto Botanical Garden wedding. One of the best of insider tips I can give my brides and grooms is to allocate 10 to 15 minutes during the reception for night shots. There are two periods of time conducive to create wedding photos. First, we have the evening golden hour which starts one hour before the sunset. Second, absolutely recommend taking pictures during the twilight hour, which lasts one hour from the sunset onwards. This particular image was taken during the twilight hour and looks absolutely amazing. What Makes This Toronto Botanical Garden Wedding Photo Special? I have to make a confession. After every wedding, I go through the images I captured and I self-critique them. That process helped me improve my craft more than all the courses and workshops I took in my career. That is the reason why I will critique this image here. What makes this picture special and what can be improved? First, this is a directed photo. The posing in this shot is inspired from fashion magazines. The groom is sitting, leaning against a tree while the bride is standing and leaning against the same tree on the opposite side of the groom. The brides pose accentuates her curves and emphasises her sensuality. The colours are simply spectacular in this image. The twilight sky makes a beautiful backdrop for this shot. Next, the image is perfectly balanced. 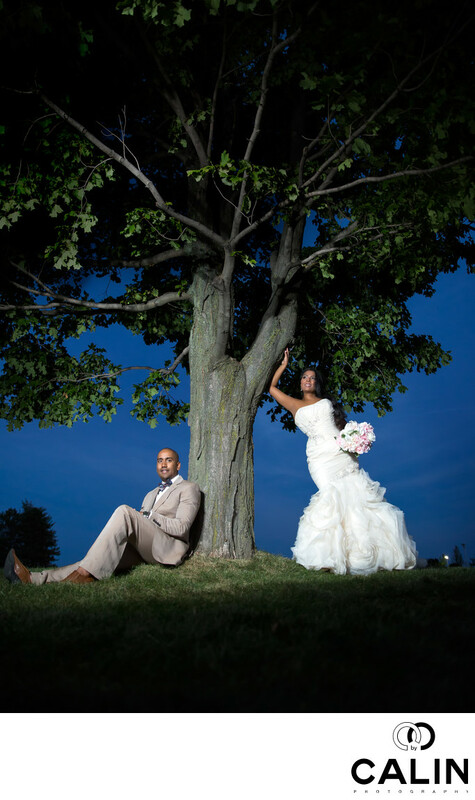 The bride and groom have the same visual weight in this image and the tree is placed along the middle axes of the photo to achieve equilibrium. To light this night wedding portrait I use the flash diffused through a translucent umbrella. That creates a soft light, very flattering to the human skin. To create an even more intense blue sky, I gelled the flash with a tungsten (CTO) filter and set the white balance to tungsten. One of the tricks when photographing a South Asian or coloured couples, is to use either golden reflectors or to gel the flashes to admit a tungsten coloured light. The golden/orange light is very flattering for couples with a dark complexion. What completes this image is a hint of the Toronto Botanical gardens, one of the most beautiful outdoor wedding venues in Toronto. As you probably already know, I always look at ways to improve my photographs. Here are a few things that I wish I did differently. First, the groom's smile is slightly forced. He was not a big fan of leaving the wedding reception to take night photos. Second, I wish I direct the bride and groom to look to the same point. By having the groom look at the camera, and the bride look at the light source, they appeared disconnected in this wedding photo. However, it is easy to critique an image sitting in front of a computer, but extremely difficult to create it when the bride and groom have only a few minutes to spare during the wedding dinner. To create this beautiful night shots I used a Canon 24 to 70 mm lens shot at 24 mm to capture both the couple and the tree.